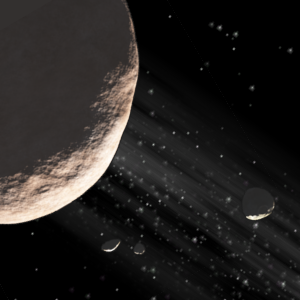 Notes The first of the so-called 'Trojan' asteroids to be discovered, orbiting the Sun at one of the Langrange Points of Jupiter's orbit, rather than within the Solar System's main Asteroid Belt. Achilles is among the largest of thousands of asteroids that form the 'Trojans', forming two groups that precede and follow Jupiter in its orbit at an angle of 60° ahead of and behind the giant planet. Achilles is part of the preceding group of Trojans, known as the 'Greek node', whose members are typically named for Greek heroes from the tradition the Trojan War. Achilles is a near-spherical body some 135km in diameter, making it one of the larger Trojans, a swarm of thousands of asteroids pursuing the same orbital path as Jupiter. The orbit of Achilles within the Greek node of the Trojans on the orbit of the planet Jupiter. 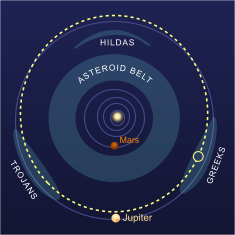 The first of the Trojan asteroids to be discovered, Achilles and its companions do not orbit within the Solar System's main Asteroid Belt, but rather follow approximately the orbital path of Jupiter. These asteroids fall within one of the five Langrange Points of Jupiter's orbit, strictly at the L4 point, allowing them to stably orbit the Sun about 5 AU ahead of the giant planet itself. There is also a corresponding point about 5 AU behind Jupiter in its orbit - the L5 point - which has its own cluster of asteroids. These two groups are collectively called 'Trojans', and the two nodes within that group are conventionally named the Greeks and Trojans respectively, representing the two opposing forces in the Trojan war.